I am a user switched from an iPhone 6s to an Android phone. I would like to continue with my WhatsApp old chats on the Android phone. So my question is there a way to transfer WhatsApp messages from iPhone to my Android phone? Has anyone else dealt with this problem?? Have the same problem as this buddy? Old conversions don't automatically come with you. Luckily, we'll try to a way to transfer WhatsApp chats from iPhone to Android phone. Hope to make your switch a pleasant experience. Following guide is applied to transfer WhatsApp from iPhone X/8/8 Plus/7/6/6s/5 to all Android devices such as Samsung Galaxy, HTC, Moto, LG phone and tablets. 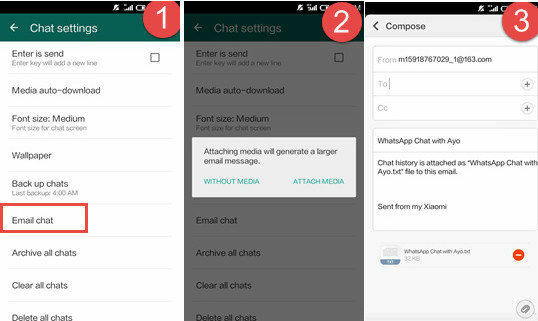 The following are three ways you can move WhatsApp from iPhone to Android. You can read after the whole article and decide which way to go. Step 1: First of all, please go to “Settings” at WhatsApp from your iPhone, tap on“Chat Settings”, then hit“Email chat” from the list. Step 2: Select the WhatsApp history that you would like to migrate. A window will pop out saying “Attaching Media will generate a larger email message”. You just need to click “ Without Media” or “ Attach Media” based on your needs. Step 3: You can type in the email addess and press “Send”. Step 4: Log in your email account on your Android phone, you can view your old WhatsApp messages at email from your new device. But you can’t sync WhatsApp messages with your WhatsApp application on Android device. Step 1: The first thing you need to do is back up your WhatsApp messages on your old device. Since the most commonly occurring issue of WhatsApp is data loss. Note: If you lost some important WhatsApp data and without backing up beforehand, we highly recommend you to give WhatsApp Recovery a free try, which can help you get all your lost files back in a couple of second. Go to “Settings” at WhatsApp from your old device and then hit “Chats Backup” from the list, You can view the latest backup or manually backup the WhatsApp messages by clicking "BACK UP Now". Step 2: Uninstall WhatsApp on iPhone. Step 3: Install WhatsApp on Android and register your original phone number at new device. A window will pop out informing that “message backup found” Click “Restore”, and WhatsApp messages on iPhone will be transferred to Android device. Note: Don't start iTunes. If starts automatically then close it. Open command prompt (RUN : cmd) or terminal. Then search for a folder named "whatsapp". You have to use command line:"dir" to see visible contents of the current folder, "dir\a" to see all contents (including the hidden and system) of the current folder or "cd [folder]" to change directory (change folder to). Copy the folder "whatsapp" to your system by using copy [source] [destination]. Step 2: Transfer WhatsApp backup to Android phone. Connect your Android device via USB to the PC. Copy your WhatsApp conversation backup file into this folder. Now start WhatsApp on your Android phone and verify your phone number. You should now get a notification that a message backup was found. Just tap "Restore", and you're done. After a few seconds, all of your messages should have safely returned. A freeware called WazzapMigrator can also help to extract WhatsApp backup from iPhone and export to Android. Below is a detailed video guide. 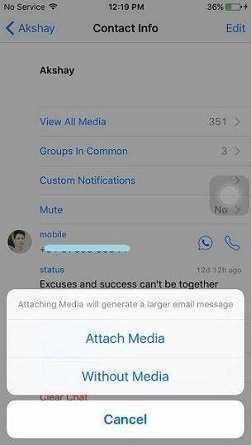 What about need to export WhatsApp messages on iPhone to computer for backup, click here for useful guide. For any WhatsApp data recovery, don't hesitate to try WhatsApp Recovery.